Moto2 & Moto3 round up: Redding storms to first Moto2 win, Vinales controls Moto3. Moto3 had the best of the weather in Le Mans and got their race under way in officially dry conditions though the track was still damp and the sky poised for rain. The usual suspects made a break at the front with Maverick Vinales, Jonas Folger, Alex Rins and Luis Salom moving away at the front. It was Vinales who would time his move to perfection, picking the right moment to up the pace and gain his second win of the season in back to back races. The victory at the scene of his first ever career win makes him the first rider to take two wins in moto3 this year, giving the Team Calvo rider a strong 13 point lead in the championship over Luis Salom. Also making the French podium was Alex Rins who held his nerve to take second for Estrella Galicia, while the all-Spanish, all-KTM top podium was completed by Red Bull Ajo rider Salom. Taking a chance on the softer option tyre proved a bad gamble for Mapfre Aspar’s Jonas Folger, it caused a few small errors meaning he had to settle for fourth. Alex Marquez rode a steady race to put both the Estrella Galicia riders in the top five, he was followed across the line by Redox RW Racing’s Jakub Kornfeil who posted some of the fastest laps of the race to push forward to sixth. Romano Fenati found some of his old form with a series of strong moves making him the highest placed Honda powered finisher in seventh for San Carlo Team Italia. British rider John McPhee was just outside the top ten again for the Caretta Technology outfit, one place ahead of team-mate Jack Miller. Fellow Brit Danny Webb, who broke his foot in Saturday’s qualifying crash was not fit to race due to a concussion sustained in the accident. Moto2 followed and was hit by the change of weather bringing the scheduled downpour and ending the race with 22 laps completed. 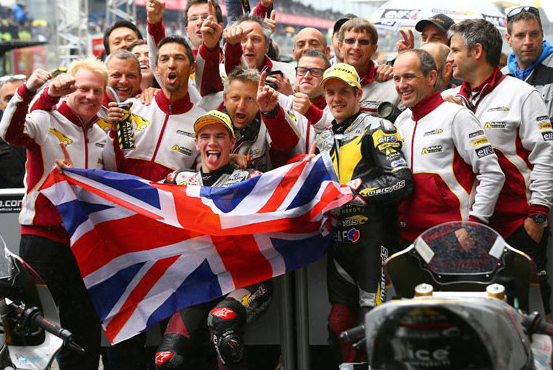 It was an excellent day for the Marc VDS team with Scott Redding taking his first ever Moto2 win, a first victory for the team. The 20 year old Brit was joined on the all Kalex podium by his team-mate Mika Kallio, giving the Belgian team a one-two finish. Belgian fans had even more to celebrate as Xavier Simeon scored the final podium spot for his Desguaces La Torre Maptaq team, beating home rider Johann Zarco, who at one point had lead the race, into fourth for the Came Iodaracing Project. The Frenchman was also the highest placing Suter rider. Redding the only non-Spanish Grand Prix winner this season, and the first since Danny Kent won in 2012, now leads the championship by a hefty 24 points from Tito Rabat. Swiss rider Dominique Aegerter had also been in with a podium shout but finished in fifth for the Technomag carXpert team. Mike Di Meglio also faired well at home, the sole Motobi user finishing seventh for the Jir team. The crashes in Moto2 were as notable as the excellent overtaking manoeuvres employed by Redding to hit the front. After just a handful of laps the Tuenti HP 40 team riders Pol Espargaro, the championship favourite, and Tito Rabat, who entered the race leading the championship, both slid out simultaneously at the same corner. They were soon followed by Takaaki Nakagami, who was leading the race by more than three seconds at the time for the Italtrans team. There were also crashes for Aspar’s Nico Terol and Interwetten Paddock man Tom Luthi. British rider Danny Kent was just outside the points in 16th one place behind his Tech3 team-mate Louis Rossi. Blusens Avintia’s Kyle Smith didn’t go the distance while Gino Rea appeared to have technical issues with his FTR bike, though was able to go back out and gain some experience finishing 26th and ten laps adrift after having been as high as 12th place. Previous Previous post: Redding: "It’s an amazing feeling"